Really? I guess I didn't know that. What law was that? Not doubting you, I can try search terms but a link would be great. ... but the real con was, as soon as they bought up everybody's gold for about $20 an oz. they automatically raised the price of gold to $35 an oz. 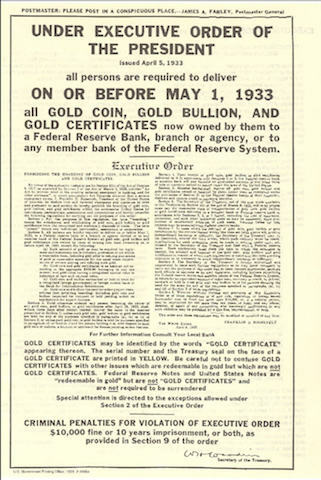 A year earlier, in 1933, Executive Order 6102 had made it a criminal offense for U.S. citizens to own or trade gold anywhere in the world, with exceptions for some jewelry and collector's coins. These prohibitions were relaxed starting in 1964 – gold certificates were again allowed for private investors on April 24, 1964, although the obligation to pay the certificate holder on demand in gold specie would not be honored. By 1975 Americans could again freely own and trade gold. Funny enough, after my last post I searched "us gold bullion illegal" and the first link was EO 6102. After reading both, I'm sure I've read them before and I guess forgot? Thanks for reminding me. I wonder who came up with that scam. How does a government just set the price of gold? Shouldn't that be dictated by the markets? Here isa good explainer although I'm unsure about the role of the Federal Reserve in it all, some articles say the gold went to The Federal Reserve, others say the it went to the Treasury. I don't know enough about these things to really understand what actually happened with lthe gold.